We take a break from seeing the housemates constantly quarreling with each other. The latest ‘Bigg Boss’ episode is definitely one with a difference. We take a break from seeing the housemates constantly quarreling with each other. This time as part of a luxury budget task,the inmates have to fight with outside enemies. 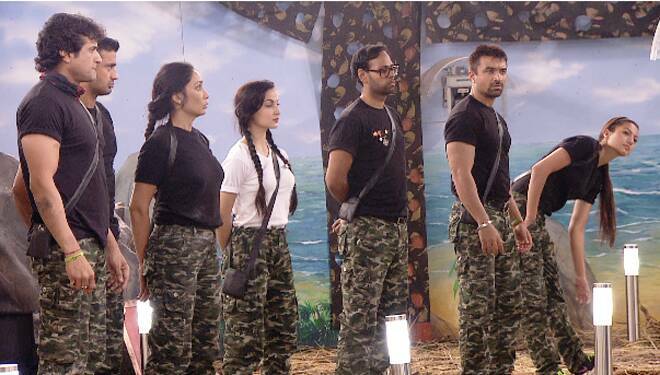 The housemates receive a letter from Bigg Boss at dawn with instructions about a military task where they had to dress up as military officials and go to war with their enemies. The garden area is transformed into a battlefield and the housemates are told to live the life like that of an army personnel. They have to cook,eat,sleep in the garden area and have access only to the washroom inside. Their main objective is to protect Mount Bigg Boss from the enemies and constantly stay on a treadmill placed in the vicinity. At every given point of time,one commando has to be on the treadmill,even during battle when the other fellow commandos have to protect them with the help of shields. Captain Elli is elected General of the Army and is given the responsibility of streamlining the task under her surveillance. The housemates have to carry out a minimum of three drills during the day and follow the orders of the General. During the day,they have to tackle the three attacks of the enemies and protect their General from being hurt. They emerge victorious from the first battle. However,during the second attack the enemy targets the commandos by throwing water balloons at them leaving Ajaz and Kamya injured. Ajaz and Kamya fail to follow the rules and are punished for their behaviour. The housemates are then asked to continue the task through the night and to be prepared for war at anytime.